NO PERMIT REQUIRED - 6 MILES ROUND TRIP - 4-5 HOURS. June to September are the best months - days are longer and the water warmer. The road to Chamberlain's Ranch can be impassable from December to April. Thunderstorms and therefore flash flood danger are greatest during the months of July and August. Flash floods are the most serious hazard in the Zion Narrows. August is the month with the heaviest precipitation while June is the driest. The monsoon season begins in mid-July and continues through mid-September so if you are considering hiking the Zion Narrows during this time period, get the most updated weather information possible from our shop or the Zion National Park Back country Desk. In late July, 1998, two hikers were swept away by swift currents caused by a flash flood.Remember that your safety is your responsibility. 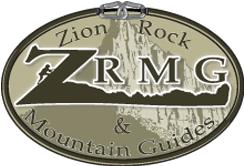 Here at Zion Rock and Mountain Guides we are not going to sell or rent you gear that you don’t need. 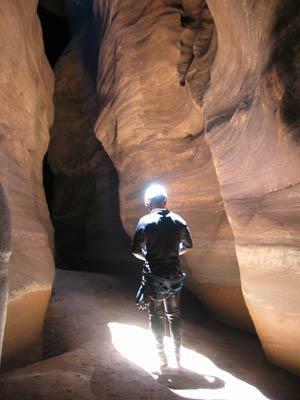 We do however want you to have a memorable and pleasurable experience in the Zion Narrows. We rent and sell gear that we believe in and use ourselves. We also are committed to staying current on the conditions you will be facing with the adventure you choose. Stop by and we’ll get you set up. 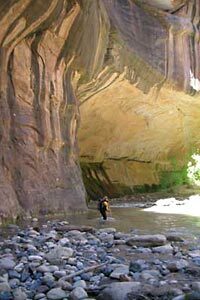 ZRMG provides shuttle service to the Zion Narrows (Chamberlain’s Ranch) trail head. NEW!! Canyon Outfitting and Shuttle Package Rates -Rent any Zion Narrows/Canyon Outfitting Package and pay $3.00 less for your shuttle.